We've seen case manufacturers put together dummy Apple products before, and while they're not always perfectly accurate, they can often be based on actual parts or specs smuggled out of the supply line. The above video was filmed at IFA 2012 and shows a quick hands-on with one such dummy, in this case an iPhone 5 by GSM Israel News. Take it as an approximation of what the iPhone 5 might look and handle like, but don't take it as anything more than that. 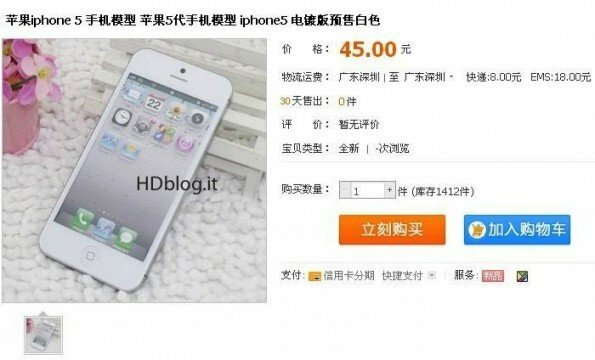 The video shows the iPhone 5 dummy in an unmarked skin case. Once removed, it looks pretty much identical to the assembled parts leaks we've seen shown off previously, complete with iPhone identifier and markings on the back. It remains taller, with a 4-inch, 16:9 screen and a centered FaceTime Camera. And it remains primarily metal-backed, with RF-friendly glass sections above and below so it can connect to networks and other devices via cellular, Wi-Fi, and Bluetooth. The 3.5mm headphone jack remains at the bottom, and the new, miniaturized Dock connector is in full view. As is a curious little oblong between the rear, iSight camera and the LED flash. While the unit we saw was a non-functional dummy, if the specs it's based upon are indeed accurate to the release hardware, it repeats several aspects of the product's design that have previously been reported based on parts and other leaks. This iPhone 5 dummy is approximately as wide as the current 4S, only taller, and sporting a widescreen display. There's a smaller home button underneath. The fake front on the Home screen sports five rows of icons on account of the extra real estate. As iMore reported earlier, there's a new, smaller Dock connector down below, in addition to a 3.5mm headphone jack. The bottom face of the design is peppered with a large speaker grille, alongside those other components. 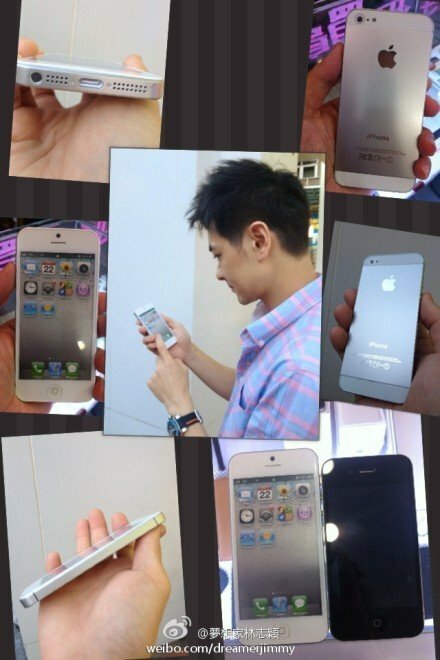 Around the back, there's a brushed metal rear panel decorated with a shiny Apple logo. Essentially, again, it looks like every leak we've seen over the past several months. The pictures we've seen from factory leaks and other sources are an almost exact match for the dummy device we saw today. While nothing with Apple is ever truly final until it's held up on stage, if this dummy is based on accurate information, does indeed look like we're in for a widescreen iPhone with a new dock connector and a redesigned chassis in just a few weeks. Update 2: We've swapped out the Hebrew language video with the English version they've just posted. Enjoy. In conclusion, as already mentioned, examples similar to the one seen are sold in some online store in China, with an adhesive screen that mimics iOS [photo below], in convenient plastic bags. September 12 is less than 2 weeks away. Thank goodness.